Drew Smith , who marched snare with Capital Regiment in 2003 and 2004, submitted this one. 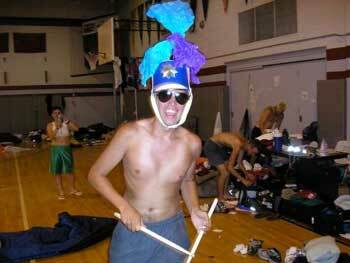 "This picture is of another CR snare, Niles Abel, at move-ins in 2004 wearing the "Tick Hat." It's an old high school band hat Niles brought from Bedford, Ind. That day, anyone who ticked had to wear the hat." Thanks Drew!